We sun infuse our farmstead herbal oils in olive oil. This gentle extraction of the herbs’ magic is powerful and rich, creating cooling, healing and enriching properties. Remember, we use only herbs we grow and wildcraft, insuring purity and freshness. 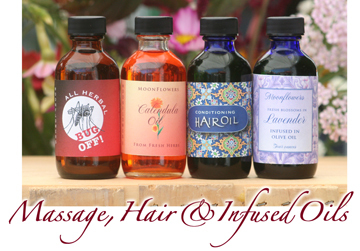 These oils are the base for our massage, perfume and body oils. St. John’s Wort relaxes muscles and helps restore damaged skin and muscles. We harvest this excellent herb in June and infuse it FRESH into olive oil, capturing all of it’s healing properties. 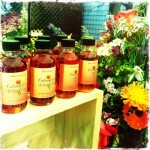 We then add our own comfrey and other healing plant extracts to this delightful and calming massage oil. For a special treat. Made with: St. John’s Wort, lavender, hemp, avocado almond, safflower & sunflower oils, & lavender eo. Made with: Sweet Almond Oil and Bitter Almond Essential Oils. 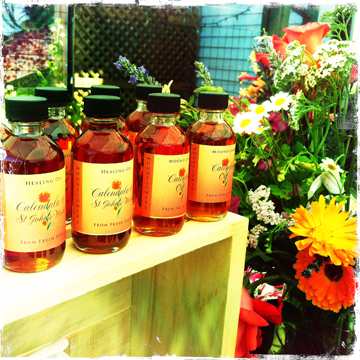 We have been perfecting our strain of Calendula Officinalis for at least twenty years. Calendula officinalis skin care benefits include – anti-inflammatory, anti-irritant, astringent, antiseptic, promotes wound healing and helps nourish the layers of skin. Our olive oil infusion is the freshest and most concentrated that we have ever seen. 2 ounces. Ask about bulk orders. Rosemary is the go-to herb for hair. The rosemary in this hair oil grows right outside our window. We solar infuse it and add more good stuff for dry or damaged hair. The essential oils in this mixture really make it an awesome experience. Rosemary olive oil, sesame, argan, jojoba, kukui, rosehip, apricot & sunflower oils, & essential oils. Apply to clean dry hair. Dash several drops into palm. Rub hands together then work through hair from roots to ends. Or use as a night treatment and shampoo as usual in the morning.